ZyXEL Wireless Controllers are designed to provide businesses with a solution that works as an AP planning, deployment, monitoring and maintenance solution while offering management, authentication and guest access within an all-in-one device. Simplifying BYOD The ZyXEL NXC2500 helps businesses to meet BYOD challenges. As more and more people are bringing their own devices to work, the workplace has gradually evolved from "one device for one person" to "multiple devices for many people". The NXC2500 has been designed to work with ZyXEL Unified, Unified Pro and Managed Series of Access Points with no pre-configuration required. The NXC2500 provides the business with multiple auto-discovery methods, Broadcast, DHCP option and DNS. With IETF standard based CAPWAP (Control And Provisioning of Wireless Access Points), secured communication can be established between the NXC controller and access points without changing the existing LAN infrastructure, this allows APs be deployed and provisioned quickly and securely within the network. The NXC2500 offers a non-stop wireless service, easy installation and secured Wi-Fi network for your business. Visualized AP planning and WLAN health management Efficiently estimating the number of APs needed and fast deployment of stable, high quality Wi-Fi coverage are two unavoidable challenges for every WLAN installation scenario. Monitoring and maintaining the health of the wireless network after deployment is equally important and usually can consume a lot of effort. In order to simplify the planning, deploying and maintaining, the ZyXEL Wireless Optimizer works in unison with the NXC2500. The Wireless Optimizer provides a pre-installation AP planning function and after installation delivers innovation that allows your WLAN Access points to act as Wi-Fi sensors to perform coverage detection that simplifies and speeds up deployment. The AP Wi-Fi sensor also provides a wireless quality index, and can be visualized into the Wi-Fi quality MAP within the wireless optimizer application, where the maintenance and optimization of the Wi-Fi deployment is no longer an "invisible" and incredibly complicated challenge. Optimal WLAN quality The ZyXEL NXC2500 comes with a range of advanced RF management functions that minimizes administrator efforts for optimized Wi-Fi quality and performance. The auto channel selection function can provide continuous, automated RF optimization to relieve administrators from the need to worry about channel settings and to determine the right channels. AP load-balancing parameters can also be set to distribute traffic, while the number of served clients among multiple APs can also be detected to improve overall efficiency. Authentication with simplified management The ZyXEL NXC2500 uses comprehensive authentication methods to manage Wi-Fi accessibility for laptops, tablets or other mobile devices with AD, LDAP or RADIUS authentication servers. 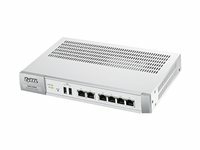 The NXC2500 also provides a built-in RADIUS server, captive portal server and DHCP server. It has the capability for fully customizable portal pages allowing you to deploy secured employee and guest access without the need for any additional servers and the user friendly guest account generator can dynamically create user accounts for guests at reception or as easily by the business office administrators. The flexible, powerful, yet friendly design all helps to demystify the professional Wi-Fi deployment and make the implementation of business class Wi-Fi easy.